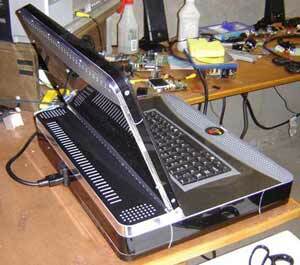 Great video of Ben Heck’s incredible PS3 laptop. After 14 months of on-again-off-again work Heck has finished his Playstation 3 Portable. Measures 17â€³ x 13.75â€³ x 3â€³ (actually thinner than a stock PS3) and weighs 16 pounds! The PS3 was built by Heck with the intentions of auctioning it off for charity.